AMC’s Theatre Support Center celebrates the company’s iconic brand and mission of creating a powerful movie-going experience. Previously located in a nondescript downtown Kansas City office building that segregated staff across multiple floors, AMC wanted its new headquarters, which is part of the mixed-use Park Place development, to catalyze cultural change and celebrate the company’s role in the entertainment industry. The open office floor plan breaks down barriers and enhances communication. Wrapping most of the facade in glass enables daylight to permeate through the open interiors. Outdoor terraces with proportions mimicking the dimensions of a movie screen are part of all three visible building elevations. As the building’s cultural and functional centerpiece, a central stairway system communicates AMC’s vision and values. It doubles as an office gathering space and multilevel theater, with digital media walls that stream news and the latest movie trailers from Hollywood. Supported by a wide range of meeting spaces, the office accommodates individual work and team collaboration. More than 17,000 square feet of whiteboard surfaces offer a backdrop for continuous brainstorming and idea sharing. A graphic history wall spotlights the story of AMC’s growth, while bold splashes of red reinforce its brand. Design elements such as movie-inspired graphics and an exterior glass pattern inspired by the vertical folds of a movie curtain reinforce the company’s industry leadership. 120,000 sq. ft. / 11,150 sq. m.
See the AMC Theatre Support Center on Google Street View. 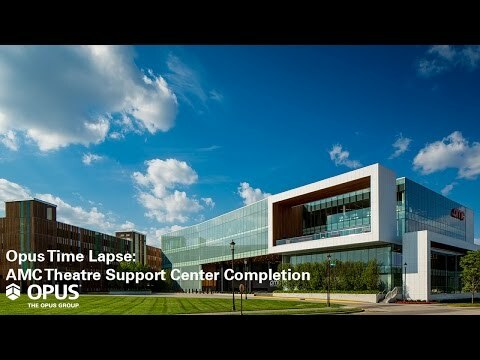 Watch Opus’ time-lapse video showing the construction of the AMC Theatre Support Center﻿.